"Understanding the Internet Puzzle Pieces"
Technology advancements in the last 10 years have created this huge communication network, capable of point and click, where users are searching for information on products, companies and doing their shopping on-line. This is the time to get involved or get left behind. The Internet is a Wide Area network (WAN) that is comprised of computers networked together to distribute information worldwide. Connectivity to the Internet is accomplished by: A Transmission Control Protocol / Internet Protocol (TCP/IP) address, Host Computer & Equipment, and a Carrier Company. 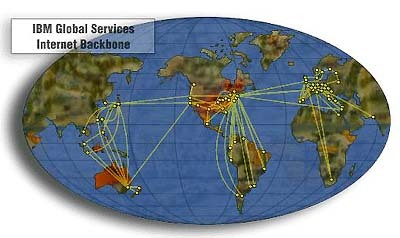 This is an example of the IBM Global 'backbone' network. Each major telecommunications company has a 'backbone' network - these combined together make up the Internet. Transmission Control Protocol / Internet Protocol (TCP/IP) address: A protocol is the technical specifications of data communications and is responsible for network communications. All computers on the Internet must use the TCP/IP protocol and have a unique TCP/IP address to gain access to the Internet. There are a limited number of TCP/IP addresses. A TCP/IP typically looks like 255.255.255.255. There are three distinct TCP/IP address classes or range of addresses that can be assigned to configure networks of varying sizes. Class A TCP/IP addresses are reserved for Government and University computer systems. Class B TCP/IP addresses are reserved for large Companies and larger Internet Service Providers (ISP). Class C TCP/IP addresses are typically used for smaller companies and smaller Internet Service Providers. Theoretically, the addressing scheme of the classes of TCP/IP address can be used to determine access speeds to your website. Additional considerations include how many Carrier switches the Internet traffic must cross. Host Computer & Equipment: A Host computer is a computer system located within the Internet network structure, this could be any computer system with a unique registered Internet TCP/IP address. Access to a Host computer is usually accomplished through the use of an Internet Service Provider (ISP). Equipment supporting Internet connectivity includes firewalls, bridges, routers, switches, hubs. Connectivity to the Internet can be accomplished through a 'dial-up' connection (modems, etc), through DSL Modem, ISDN Circuit, Frame Relay Circuit, Point to Point Cabling or Backbone Circuits. Bandwidth refers to how the size of the circuit providing internet connectivity. Use the table below for examples of bandwidth capabilities. A larger circuit connected to the host computer ensures that the host can accommodate greater amounts of Internet traffic. Modem (14.4K, 28.8K, 56K) Typical modem speeds. Lowest bandwitdh. Used primarily for 'dial-up' connections to the Internet. Carrier Company: The Carrier Company provides the physical media (cabling) for the Internet connection. Carrier companies are usually phone companies and/or subsidiaries (US West, AT&T, MCTI, etc). The carrier provides the necessary cabling to connect to the Host computer. The World Wide Web is the most outgoing and accessible incarnation of the Internet. The Web was born with the invention of the first browser software (Netscape, Microsoft Internet Explorer, etc.). The browser software reads documents written using HTML, aka Web pages.